PIKETON--It was another amazing year for volunteers running the 2017 Christmas Gifts for Children Program at Fluor-BWXT Portsmouth (FBP) in Piketon. Thanks to coordinators, volunteers and donations, more than 3,000 children from needy families in our communities had a much happier Christmas. 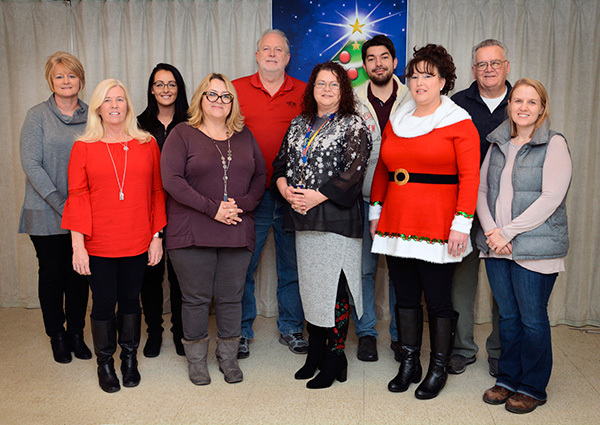 At the Portsmouth site, it’s more than just a program; it’s a 25-year tradition where employees, individuals, families and businesses all chip in to help the less fortunate. As a result, it’s also one of the most widely adored events of the year, tugging at heartstrings between those who give and those who receive. In order to complete such an endeavor which spreads across several counties (Adams, Jackson, Pike, Ross, Scioto and Greenup, Ky.), coordinators locate a venue to display the tags containing children’s Christmas wishes. Some of the venues include areas on and off site, reaching into the lives of shoppers who joyfully purchase gifts for children in need. Any unclaimed tags are handled by the numerous volunteers who use donated funds to shop for these remaining children. During the year, several fundraisers are held at the site to help raise the money needed to buy gifts so that none of these children fall between the cracks. Every child should be able to enjoy Christmas, regardless of the circumstances. 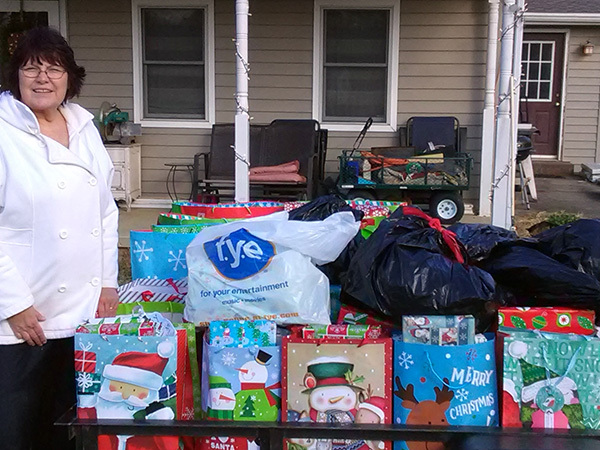 Gary Crandall is president of the Christmas Gifts for Children Program and is a Systems Engineer for FBP. “This year, a grandmother contacted us for help after finding our Facebook page. Her adult children have all been involved with drugs and in and out of jail and she is trying to raise her three young grandchildren by herself. After giving her a big bag of Christmas gifts for each of the children, we offered her a turkey, but she said that she didn’t have an oven that worked to cook it in. Luckily, the hams we had were pre-cooked, so she was very thankful to receive one of them,” Crandall said. More than 40 volunteers served as coordinators for the 32 different local schools and 14 child support agencies (children’s services, homeless shelters, etc.). The coordinators obtained the names of these most needy children which were then cross-referenced to prevent duplication. More than 100 additional names were added to the program as a result of families calling in to the plant requesting help for their children. FBP’s Dominica Hannah, who works in Labor Relations and volunteers as a coordinator, said this year’s deliveries were different. Mary Ellen Rooney, FBP, volunteered as a coordinator for two Scioto County schools. 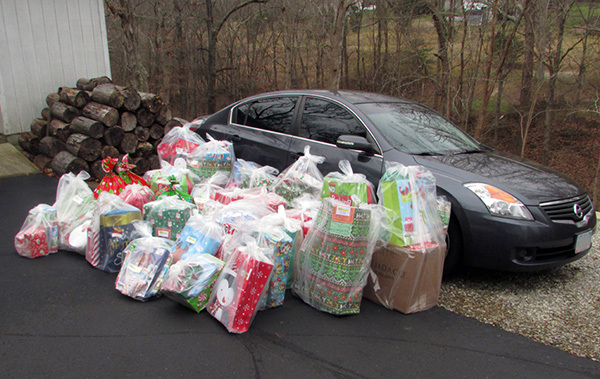 “We loaded presents for 64 kids onto my husband’s trailer to deliver to the school and I followed behind to ensure that no presents were blown away. We were greeted by the school’s secretary and principal and they helped unload the gifts to a secured classroom. They [Jody Lucas and Foresta Shope] were so appreciative of our program and the support we provided the Sciotoville community. I know we have touched many families with the Christmas Gifts Program who otherwise would not have had a Christmas!” Rooney said. In addition to the fundraisers, several contractors working at the site and many local businesses, organizations and individuals provided donations to help fund the Christmas Gifts for Children Program. Combined with about $15,000 raised by site employees through the fundraisers, these donations added up to more than $47,000 for the 2017 Christmas Gifts for Children Program. All of these funds were needed to buy Christmas gifts for these children. 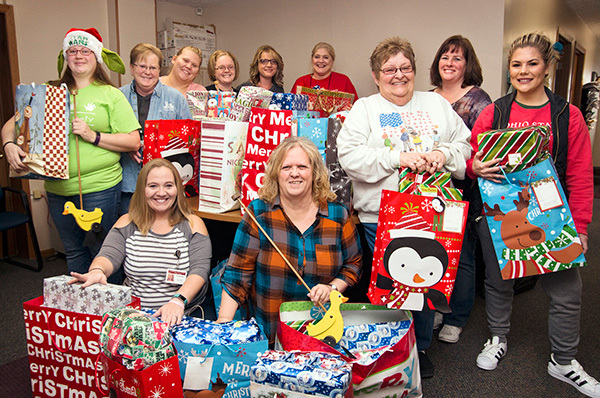 Since 2011, the Christmas Gifts for Children Program has provided gifts for more than 18,000 disadvantaged children. Engineering’s Mary Ellen Rooney (Fluor-BWXT Portsmouth) prepares for the journey to Sciotoville with the presents wrapped and ready.